After watching last night's game versus the Los Angeles Kings, I can say that the Calgary Flames made a good hockey move for their franchise. By reacquiring Craig Conroy from the Kings, the Flames have addressed what has been a major issue all season: no top-line centre. In his return to Calgary last night, Conroy scored twice in a 4-1 win over the Kings, and looked quite comfortable on the ice. Calgary still holds top spot in the Northwest Division, and third in the Western Conference, with a game in hand on the Vancouver Canucks. While it's no secret that Darryl Sutter is not a huge Craig Conroy fan, Sutter listened to his star, Jarome Iginla, and finally completed a trade that had been in the works for some time. They gave up a couple of draft picks and Jamie Lundmark, who has shown that he may never live up to his potential, so the loss may offset the addition. And since Conroy's contract is up at the end of the season, it will give Sutter some room to make a deal to keep Conroy this time. Don't forget that Conroy was the man playing alongside Iginla when the Flames lost in Game Seven of the 2004 Stanley Cup Finals to the Tampa Bay Lightning. I believe that Sutter won't let Conroy walk away this time. - It is reported today on Sportsnet that the Rangers are no longer interested in Peter Forsberg of the Philadelphia Flyers due to health-related concerns. They are now looking at trying to acquire Keith Tkachuk from the St. Louis Blues, Bryan Smolinski from the Chicago Blackhawks, or Josef Vasicek from the Nashville Predators. There is some concern that the asking price for any one of the three players could be blue-chip defenseman Marc Staal, currently playing for the Sudbury Wolves. It remains to be seen what the Rangers counter-offer for any of the three players would be, but Petr Prucha is another name being floated around. - The Los Angeles Kings have all but conceded this season at this point, and GM Dean Lombardi has made it clear that any aging free-agents-to-be may be shipped out. This includes the likes of Sean Avery, Brent Sopel, and Aaron Miller. Rob Blake's name has been linked to the Edmonton Oilers, but it would take a major offer of players from the Oilers to get Blake. Raffi Torres and Joffrey Lupul are two names involved in that trade on the Oilers' side. - According to multiple reports, Brad Stuart of the Boston Bruins will be moved before the deadline. Possible destinations include Chicago, Anaheim, Philadelphia, Edmonton, and Ottawa. Of those five teams, only Anaheim and Ottawa seem to be looking for depth defensemen. - Rumours are swirling about the Edmonton Oilers' interest in reacquiring Eric Brewer from the St. Louis Blues. Jarret Stoll's name has come up in these rumours as the top candidate to be headed to St. Louis. - Peter Forsberg's name continues to be linked with as many as twelve NHL teams. In the meeting Forsberg had with Paul Holmgren, Philly's GM, it was determined that Peter Forsberg should get healthy and not worry about being traded. If he does get traded, I would hazard a guess and say that he will return to Philadelphia next season. He and Gagne play well together, and Holmgren knows the fans like Forsberg. He's big, he's exciting, he plays with an edge, and he seems to be a good fit when he's in the lineup for the Flyers. John Buccigross of ESPN says he will be traded, and I feel the same way. I do see him returning in 2007-08 to the Flyers, though. - Shane Doan's name has been dropped as a man who may be headed out of Phoenix if the Coyotes don't make the playoffs. It appears that the Coyotes may be asking either too much as these rumours have fallen off as of late. - The Chicago Blackhawks are reportedly shopping the likes of Bryan Smolinksi and Adrian Aucoin, and have all but made themselves sellers. Unless this team turns a corner fast and starts winning handfuls of games at a time, the Blackhawks will almost certainly unload some veterans. - The Florida Panthers have nearly made themselves sellers, and it sounds like Bertuzzi might be the big sale. Almost everyone could be considered movable in south Florida, with the exceptions of Olli Jokinen, Jay Bouwmeester, and Nathan Horton. Martin Gelinas is another player rumoured to be on his way out as soon as someone offers something for him. - Darcy Tucker's name keeps coming up in Toronto trade talk with Edmonton, Ottawa, and Calgary as possible destinations. Paul Maurice has gone on record that Tucker wants to remain in Toronto, but if the right deal comes up, don't be surprised if he gets moved to a team looking for a gritty winger. I'd rule Calgary out at this point, having reacquired Conroy, and Edmonton needs a puck-moving defenseman more than they need a gritty winger. Now I'm sure there will be other deals involving depth players. I don't see many goaltenders being moved, unless they are back-ups. In any case, it should make for an interesting few weeks leading up to the deadline. As more teams drop off in their hunt for a playoff spot, look for the number of sellers to increase. However, with 20-24 teams currently within 10 points of a playoff spot with approximately 30 games to play, this race will make for an interesting finish! The AHL Skills Competition went last night. I'm not sure how many of you caught it, but it was pretty good. I like the NHL Skills Competition too, mainly because it's fun for both the fans and the players. The AHL's version didn't disappoint either. In the end, Planet USA defeated Team Canada 19-14, winning the event for the third time in the last four years. I'll quickly run through the winners of each event. Hardest Shot: Dustin Byfuglien (Norfolk Admirals) of Planet USA - 98.7 mph. Puck Control Relay: Erik Westrum (Toronto Marlies) of Planet USA. Top Goaltender: Karri Ramo (Springfield Falcons) of Planet USA - stopped 15 of 19 shots. Accuracy Shooting: Clarke MacArthur (Rochester Americans) of Team Canada - 4 targets in 5 shots. Fastest Skater: Jonathan Filewich (Wilkes-Barre/Scranton Penguins) of Team Canada - 14.553 seconds. Rapid Fire: Curtis McElhinney (Omaha Ak-Sar-Ben Knights) of Team Canada - stopped 10 of 10 shots. The AHL All-Star Game goes tonight, and can be seen on Rogers Sportsnet in Canada, or a number of stations in the US. Also, the game can be watched via broadband on your computer, thanks to the AHL and B2 Networks. This can be accessed by heading to the AHL website. Gary Bettman made his way to Atlanta on Sunday to unveil the 2008 All-Star Game logo, and speak to the media in Atlanta. Honestly, this logo does nothing for me. The star is evident, but the Thrasher is almost an after-thought. I hate how they just sort of tacked "Atlanta 2008" at the bottom like it really doesn't matter. It almost seems like this logo was designed in 10 minutes. A quick message to Atlanta's hockey organization: this is a marquee event. Put a little effort into designing a logo that looks good on a jersey and T-shirt, let alone on paper. Once again, disappointment from the NHL All-Star Game. Finally, R.I.P. to Lorne "Gump" Worsley, who passed away at the age of 77 at his home in Beloeil, Quebec on Friday. Worsley played 126 games in the AHL for the New Haven Ramblers, Providence Reds, Springfield Indians and Quebec Aces during his storied career, which included 21 seasons in the NHL. Worsley won the Calder Trophy as the NHL's top rookie in 1952-53, and led the Canadiens to four Stanley Cup championships. Rest in peace, Gumper. You will be remembered. What's odd about this picture? Ok, besides the Barney Rubble Hairpieces' jersey? That's right, the Islanders took to the ice on Saturday wearing a throwback from their 1972 team. 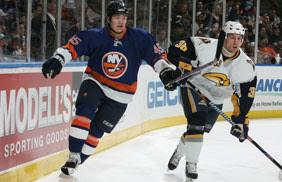 Aaron Asham, the Islander in the picture, is proudly displaying the teams' retro colours. The 1972 jerseys look good, but the 2007 helmets do not. If the Islanders want to go retro and want to look good, they need to take a page out of the Vancouver Canucks' book on retro jerseys, especially the helmet on Markus Naslund. Notice it matches the colour of their jerseys? That's the sign of a team that knows how to dress. I did notice a couple of problems with the retro jerseys besides the helmet. The numbers in red were hard to see on television. I caught the highlights, and found it to be a little tougher than normal to distinguish who was whom. Also, if it were a throwback to honour the team, the 1972 Isles didn't wear their names on the back of the jersey. Oh, and the Reebok logos were very noticeable. I do like the socks, though. And the lace-up neckline is always stylish. Overall, I like the jerseys. They aren't eyesores, and they certainly look better than the Islanders' homage to the pylon. Thumbs up from this blogger. The Score: Lots of scores today, and a lot of them have made an impact on the standings in the league. The New York Rangers defeated the Philadelphia Flyers 2-1, temporarily moving the Rangers into 8th place in the Eastern Conference. The Ottawa Senators defeated the Boston Bruins 3-1. The Toronto Maple Leafs defeated the Montreal Canadiens 4-1, tying them with the Rangers for 8th spot in the Conference. The retro-outfitted New York Islanders defeated the Buffalo Sabres 5-3, leaving them one point behind the 8th spot in the Conference. The Washington Capitals hammered the Carolina Hurricanes 7-3. The Columbus Blue Jackets defeated the Minnesota Wild 3-2. The Florida Panthers defeated the New Jersey Devils 3-2, only New Jersey's second outright loss in the last 14 games. Games that are still on-going feature the Pittsburgh Penguins visiting the Phoenix Coyotes, the Nashville Predators visiting the St. Louis Blues, and the Los Angeles Kings visiting the Edmonton Oilers. Also, don't forget, faithful readers, about tomorrow night's AHL All-Star Skills Competition. Until tomorrow, keep your sticks on the ice! Hockey is coming back to Cleveland. Not NHL hockey, but AHL hockey. After the Barons left last year for Worcester, the city of Cleveland was left without hockey. But thanks to the efforts of the Cleveland Cavaliers ownership group, the Lake Erie Monsters will take to the ice next season. The Monsters will be the primary affiliate to the NHL's Colorado Avalanche, who currently share an affiliation to the Albany River Rats with the Carolina Hurricanes. The Monsters' primary team colors will be wine, blue, yellow and black. (wine - PMS 201C, yellow - PMS 130 and blue - PMS 647). The home jersey will be white with wine shoulders and black trim segments on the arm sleeves and will feature the secondary "M" logo, featured to the left, on the front. The road jersey will be wine with black and white trim segments on the arm sleeves. Both home and road jerseys will have the Monster from the primary logo on each shoulder. Player numbers will appear on each shoulder sleeve and on the back of each jersey. Since this appears to fit the new jersey design by Reebok, the jerseys may look quite normal, with the exception of the unsquare jersey hem on the bottom. The team name was selected after an extensive amount of research was conducted with focus groups made up of casual fans, high level hockey fans, former Cleveland pro hockey season ticket holders, and others. In addition, considerable research explored names that would have a fun connection to the region. The Lake Erie Monsters was the top preference from the focus groups. My only concern about the entire franchise is the appeal of hockey to Cleveland. This can't be a "make money now, not later" operation. It will take some time to cultivate the hockey culture back into Cleveland. I honestly wish the Monsters good luck in 2007-08. The 28th AHL team makes the league a little stronger. I think that says enough. It's time for the city, county and state to step up and deliver an arena for the Penguins. Do it now. Make it happen. There is such a long-standing hockey tradition in Pittsburgh, and it would be a travesty to the game if the Penguins were allowed to leave. For all that is good in hockey, get a deal done for a new arena. With an exciting, young team with the likes of Crosby, Malkin, Staal, Fleury, and Whitney, the Stanley Cup may not be far away. And with another blue-chip prospect in Letang only a year or two away, the Penguins are poised to be a very competitive team for a long, long time. 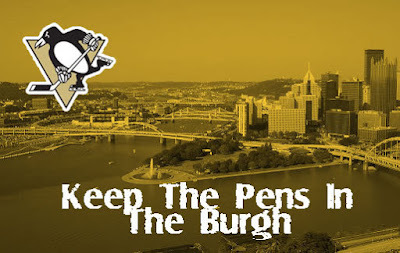 Keep the Pens in the Burgh. Ok, that's all for today. Keep your sticks on the ice! The AHL All-Star Game and Skills Competition is being played in Toronto's Ricoh Coliseum on January 28-29. This game is a showcase for the up-and-coming talent that awaits the NHL. The AHL does their All-Star Game a little differently, pitting Team Canada versus Planet USA. Reebok is the game's major sponsor, but the players won't be wearing any snazzy new duds like their counterparts in the NHL. The competition in the AHL All-Star Game is just as high as the NHL All-Star Game, and allows the next generation of stars to shine brightly. In 1997, the AHL switched to its current format of Team Canada versus the World Team (renamed Planet USA the following year) in Saint John, New Brunswick, home of the Saint John Flames. The Skills Competition was dominated by the World Team, winning the event 18-9. The All-Star Game was quite a battle. The teams played to a 2-2 final after 60 minutes and five minutes of overtime. In an unprecedented first, the AHL used the shootout to determine the winner, almost a decade before it was used in regular season play. The World Team won the shootout for a 3-2 victory, and were led by then 20 year-old Tomas Vokoun who, after stopping 19 shots during the game, stopped four of five Team Canada shooters in the shootout. Other current NHL stars that played in the game is like a list of "who's who": Patrik Elias, Andrew Brunette, Anson Carter, Greg de Vries, and Vaclav Prospal. Peter Laviolette, current head coach of the Carolina Hurricanes, captained the World Team, and John Stevens, current coach for the Philadelphia Flyers, played defense for Team Canada. The 2003 AHL All-Star Game in Portland, Maine was also a chance for some future stars to showcase their talents. The list of names that participated in that game is also lengthy: Ray Emery, Brad Boyes, Jason Spezza, Brian Pothier, John Pohl, Philippe Sauve, and Mike Komisarek. In that event, Team Canada won the Skills Competition over Planet USA 15-13, and won the All-Star Game 10-7. Every year that the AHL All-Star Game has been around (since 1995), it has showcased the young, emerging superstars that will, one day, be NHL stars. Perhaps as a tribute to being the developmental league for the NHL, the AHL prides itself on its graduates. 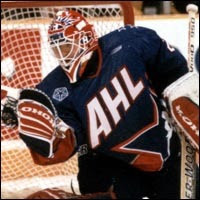 Of the 394 players to take part in the AHL All-Star Classic since 1995, more than 93 percent have competed in the National Hockey League, including Patrice Bergeron, Jonathan Cheechoo, Pavol Demitra, Rick DiPietro, Miikka Kiprusoff, Kari Lehtonen, Ryan Miller, Dwayne Roloson, Martin St. Louis, Eric Staal, Steve Sullivan and Kyle Wellwood. One of the reasons I really enjoy the AHL All-Star Game is because of the "Commissioner's Pick". Basically, the Commissioner hand-picks someone to represent the teams in the form of the captaincy. This year, Mike Keane of the Manitoba Moose, and Kip Miller of the Grand Rapids Griffins were chosen by Commissioner Dave Andrews to represent Team Canada and Planet USA, respectively. While Keane and Miller are hardly "the next generation", they get to play in the All-Star Game due to their commitment to hockey, and their leadership as veterans. This is one of the classiest moves by any league in any sport. This year, over 100 million viewers have a chance to see the next NHL stars. The AHL has partnered in Canada with Rogers Sportsnet to have the game televised, and will have the game televised in the US over 18 regional networks: New England Sports Network (NESN); America One; Fox Sports Net (FSN) in its New York, Pittsburgh, Ohio, North, Southwest and Arizona regions; Comcast SportsNet Philadelphia, Mid-Atlantic, Chicago and West; Comcast Local will air the event to its subscribers in Michigan and Indiana; CSS and Sun Sports will bring the AHL All-Star Classic to fans across 11 states in the southeastern United States; and Altitude Sports and Entertainment will carry the event for its viewers in a 10-state territory of the Rocky Mountain region. The 2007 Reebok Hockey AHL All-Star Classic will also air live on NHL Center Ice to subscribers in the U.S. However, the AHL has gone a step further by partnering with B2 Networks to provide a live video broadband webcast of both nights’ festivities at no charge to fans around the world. Anyone with a high-speed cable modem or T1 or DSL broadband connection and Windows Media Player 9 or higher can view the Skills Competition and All-Star Game through the links to be provided on the official Web site of the American Hockey League, theahl.com. This is how an event is supposed to be run. Gary Bettman should be learning from the AHL on how to run a successful event. They have several large networks carrying the game in all major markets, they have a free broadband feed of the game, and the event itself is about the stars, not the corporate fat cats. Take note, Bettman: if you want to do it right, take a page from the AHL. Everything that is good about your league now got its start in the AHL. Just thought I'd throw this little piece of info up on how the Skills Competition will play out tonight. The picture featured here is Alexander Ovechkin showing off his new blue visor. I actually like it better than the smoke gray one he used to wear, mainly because the Capitals' colours are/were red, white, and blue. Now if only they would change back to those colours and bring some sense back to the Capitol. I hope Ted Leonsis is reading this. Puck Control Relay: one goal awarded to winning team; one goal awarded to winning individual's team. Fastest Skater: one goal awarded to fastest skater's team; one goal awarded to team with lower average time. Shootout - Part One: each goal counts as a goal for the team; goaltenders' goals-against record is combined with the "In The Zone" event to determine the winning goaltender. Hardest Shot: one goal awarded to the team with the shooter who has the fastest shot; one goal awarded to the team with the higher average speed. Shootout - Part Two: each goal counts as a goal for the team; goaltenders' goals-against record is combined with the "In The Zone" event to determine the winning goaltender. Shooting Accuracy: one goal awarded to the most accurate shooter's team; one goal awarded to the team with the least number of shots. In The Zone: one goal awarded to the highest-scoring team; goaltenders' goals-against record is combined with the "Shootout" events to determine the winning goaltender. Shootout - Part Three: each goal counts as a goal for the team; goaltenders' goals-against record is combined with the "In The Zone" event to determine the winning goaltender. One-On-One Shootout: each goal scored counts towards the team's total; three goals awarded to the highest scoring team. I used to enjoy the NHL All-Star Weekend. The Skills Competition and Future Stars game was held on the Saturday, and the All-Star Game was held on the Sunday. It was a great way to showcase the NHL's talent over two days. The NHL used to close shop on the Wednesday to allow players to get to the city where the All-Star Game was being played. The NHL would hold their FANtasy event for the fans during the Thursday and Friday, and the weekend would be a showcase for the players. I liked this set-up. Now? I'm not such a fan of the "All-Star Week". No one seems to care anymore about the game. The players come up with convenient excuses not to go, the fans don't go because their favorite players aren't there, and the "corporate sponsors" show up just to get wined-and-dined by Gary Bettman and his travelling show. Now, I'm not saying the game isn't fun. This Owen Nolan goal versus Dominik Hasek at the 1997 All-Star Game was certainly one to remember. And watching Mario Lemieux score 4 goals at the Civic Arena in Pittsburgh in the 41st All-Star Game is another piece of hockey history. But the list of names not at the All-Star Game in Dallas is astounding: Jarome Iginla, Scott Niedermayer, Chris Pronger, Henrik Zetterberg, Mike Modano, Peter Forsberg, Jason Spezza, Ilya Kovalchuk, Jaromir Jagr, Paul Kariya. How is it that the biggest stars in the game can be overlooked? Granted, some are injured, but others are not. Justin Williams? Do people in Carolina even know he plays for the Hurricanes? Lubomir Visnovsky? I'll wager $5 that people in LA don't know he exists, let alone plays for the Kings. I'm not saying that Williams or Visnovsky don't deserve to be there. On the contrary, if you're having a great season, you deserve to go. But how is it that Yanic Perreault, 25-point man for the Phoenix Coyotes, gets to go while Paul Kariya, 53-point man for the Nashville Predators, gets to watch the game from home? Something is wrong with this picture. Very wrong. I would have loved to see Selanne and Kariya play together again at this year's All-Star Game, but since that won't be happening, I'd be better off watching PBS. I want star power. I want an NHL "All-Star" Game. Nothing else will do. Following up on my profile of the two head coaches at this year's All-Star Game, today we look at Randy Carlyle, head coach of the Anaheim Ducks. Randy Carlyle was born April 19, 1956 in Sudbury, Ontario. His junior hockey career took off in the OHA, playing for the Sudbury Wolves from 1973-1976. He played 139 games over three seasons, scoring 32 goals and 119 assists for 151 points. He also racked up 265 PIMs. 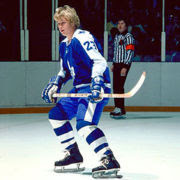 Carlyle was drafted in the 2nd round at #30 overall by the Toronto Maple Leafs in 1976. He was also drafted by the Cincinnati Stingers of the WHA in the first round, 7th overall, in 1976. Carlyle spent his first two seasons moving between the CHL and the NHL. In the CHL, he played with the Dallas Blackhawks for 47 games. In those 47 games, he scored 5 goals and 21 assists for 26 points, to go along with 94 PIMs. With the Maple Leafs, he played 94 games, scoring 2 goals and 16 assist for 18 points while picking up 94 PIMs. On June 14, 1978, Randy Carlyle was traded with George Ferguson from the Maple Leafs to the Pittsburgh Penguins for Dave Burrows. Randy Carlyle's NHL career with Pittsburgh established him as an NHL defenceman. In 1980-81, Carlyle won the James Norris Memorial Trophy for being the league's best defenseman. He also posted his best stats of his career that year. Playing in 76 games, Randy scored 16 goals and 67 assists for 83 points while picking up 136 PIMs. In six seasons with Pittsburgh, Carlyle played in 397 games, scoring 66 goals and 257 assists for 323 points while spending 582 minutes in the penalty box. However, on March 5, 1984, Randy Carlyle was traded again, this time from Pittsburgh to the Winnipeg Jets for future considerations and a first-round pick in the 1984 Entry Draft (it turned out to be 9th overall, and Pittsburgh selected Doug Bodger). In Winnipeg, Carlyle established himself as a fan favorite, and played 10 seasons with the Jets. He never came close to his career-best season of 80-81, but he did equal his highest goal output of 16 twice in Winnipeg (1985-86 & 1986-87). He was regarded, later in his career, as more of a defensive defenseman, and was quite vocal as one of the Jets' alternate captains. In 1055 NHL games, Randy Carlyle scored 148 goals and 499 assists for 647 total points. He also spent 1400 minutes in the sin bin. 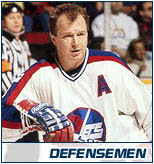 Randy Carlyle retired from the NHL with the Winnipeg Jets in 1993. 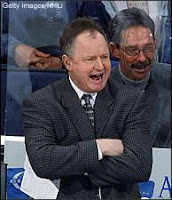 Randy Carlyle's coaching tenure started in the NHL as an assistant coach with the Winnipeg Jets in 1995-96. Randy's NHL coaching days would soon be numbered as the Winnipeg Jets packed up the franchise and moved south to Phoenix. Carlyle was not retained as part of the move, and he decided to take an assistant coach's job with the IHL's Manitoba Moose under Jean Perron as a result. The Moose never responded to Jean Perron's hard-nosed coaching tactics, and played poorly through their first 50 games, going 16-26-8. Perron was removed as head coach, and the reins were given to Carlyle for the remainder of the season. The Moose ended up last in the IHL's Midwest Division, going 32-40-10 for 74 points, and placed 16th out of 19 teams. However, Carlyle went 16-14-2 in 32 games, and the players appeared to respond to Carlyle's coaching strategies. The Manitoba Moose made the playoffs for all four years that Carlyle was the head coach for the entire season. They never made it past the second round of the IHL playoffs, but finished with no less than 85 points in any of the four seasons. Their best season in the IHL came in 1998-99 when the Moose finished with a record of 47-21-14 for 108 points. However, after the 2001 season, the NHL came knocking on Carlyle's door once again. In 2002-03, Carlyle found himself behind the bench for the NHL's Washington Capitals. They made the playoffs in his first year, ending up sixth in the Eastern Conference. In 2003-04, the Capitals failed to make the playoffs. In 2004-05, Randy Carlyle returned to Winnipeg to take over the head coaching duties of Vancouver's AHL affiliate, the Manitoba Moose. Carlyle was given the opportunity to guide the Moose after the Stan Smyl experiment failed. Carlyle's coaching proved to be a wise move as the Moose posted 44-26-7 for 98 points. He guided the team to a Western Conference Finals showdown with a longtime IHL rival, the Chicago Wolves. The Wolves prevailed, but it was this showcase that allowed the NHL to see that he is a wise and talented coach. After Mike Babcock left for Detroit, Brian Burke hired Randy Carlyle to coach the Anaheim Mighty Ducks. In his first season, Carlyle guided the Mighty Ducks to a 43-27-12 record for 98 points and the 6th seed in the Western Conference. In playoffs, Carlyle proved his mettle by guiding the Mighty Ducks to the Western Conference Finals before losing to the Edmonton Oilers 4 games to 1. To date this season, the Anaheim Ducks are third overall in the NHL with a record of 30-12-8 for 68 points. Randy Carlyle has the Ducks playing sound defensive hockey, and a strong forecheck has proven to be a highlight for the Ducks. Teemu Selanne has also responded well to his old Jets' teammate, currently 10th in NHL scoring with 30 goals and 29 assists. Never one for the spotlight, Carlyle lets his actions speak louder than his words. Lindy Ruff and Randy Carlyle shared a conference call on Monday. You can read the article here. Sounds like both men are prepared for a little more fun than their intensity normally shows. Until tomorrow, keep your stick on the ice! 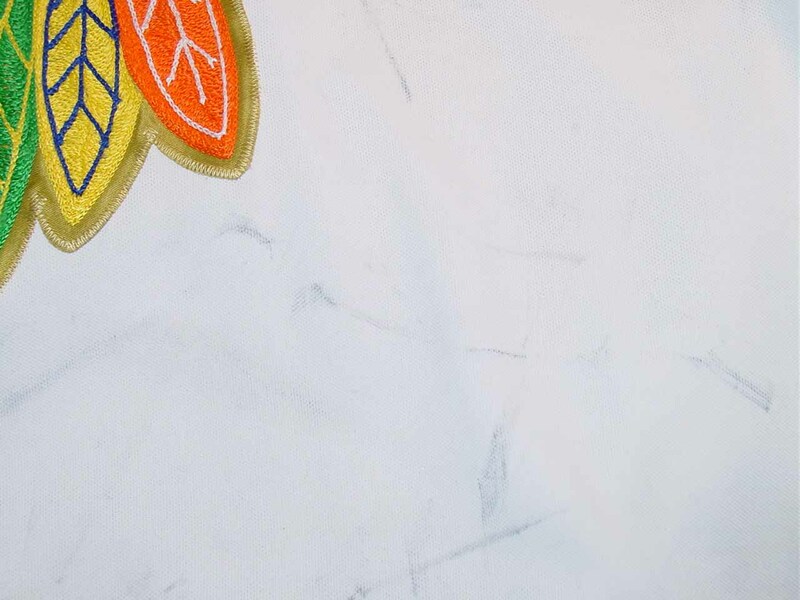 In case you haven't heard, the rumours are true: no new NHL jerseys to report. The only ones made available at the press conferences in both NYC and Dallas were the All-Star jerseys. Once again, Gary Bettman screws up the easiest of things: an NHL press conference. I've searched NHL.com to see if they have a publicist job open, but apparently they don't. I wonder if they're working on creating one? If they aren't, we're in for a long summer of rhetoric and bee-ess. Reebok also has some information on their "Edge Uniform System" up on their website. However, mostly everything else is "coming soon". Again, a PR nightmare pulled off by two of the biggest sports companies in the world. - no tucking in. I reported this a few weeks ago on the Uni Watch Blog. The NHLPA killed the idea of tucking the jerseys inside the pants as it restricted movement, and trapped heat inside the jersey. - no templates. Reebok is allowing the teams to redesign their own jerseys using the new materials. The stitching may be different, but the creative elements will still be allowed. In this regard, this is definitely a highlight. - lace-up necklines will still be allowed. This allows the Rangers to keep their traditional dark jersey, and allows Boston to use their alternate jerseys as their home jerseys next season. If Boston does, they automatically move up my jersey scale. - traditional jersey elements, such as the Chicago Blackhawks chain-stitched logo and the Detroit Red Wings vertically-arched lettering for names, can still be used. Will it? Tradition says that should never change. Ever. For any reason. Someone better be listening. - as I stated on the Uni Watch Blog a few weeks ago, the Toronto Maple Leafs will not be changing their logo. The NHLPA also killed this idea due to Toronto's "timeless" and "classic" logo. Apparently, a drop-shadow or some sort of shadowing is all that is being added to the current logo. - the AHL is also going to this new jersey system. I am very interested to see how some of the AHL logos and promotions will be affected. The downfall of this NHL "unveiling" is the fact that they only showed off the All-Star jerseys. Personally, I wanted to see some of the new jerseys, especially those of the Original Six. I am also interested in seeing who had new logos since it was reported that six teams will be changing their logos. Of those confirmed, Columbus and Dallas are definites, Vancouver is a maybe, and three others are unknown. Until the playoffs end, there will be much speculation over this entire story. I'd like to look at the two men who will be coaching the Eastern and Western All-Star teams: Lindy Ruff, and Randy Carlyle, respectively. I'll start with the East today, and finish with the West tomorrow before the Rookie Game and the Skills Competition. Rarely do NHL coaches outside of Scotty Bowman get much exposure, so this will be a good way to get to know the two men who have two of the best teams this season. Lindy Ruff was born February 17, 1960 in Warburg, Alberta. His junior days were spent playing for the Lethbridge Broncos of both the WCHL and the WHL, as well as the Taber Golden Suns of the AJHL. He was drafted 32nd overall in the 2nd round of the 1979 NHL Draft by the Buffalo Sabres*. 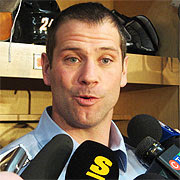 Ruff was known as a defensive player in his days in the NHL. His best season in terms of points came in 1981-82 where he scored 48 points (16 goals and 32 assists) in 79 games. He also racked up 194 PIMs, the highest total of his career. Ruff wasn't a lifelong Sabre, though. In 1988-89, he joined the New York Rangers, and played 83 games over 3 seasons with the Broadway Blueshirts, scoring 15 points. In 1991-92, he joined the Rochester Americans of the AHL for 62 games, scoring 34 points. In 1992-93, he finished his playing career with the San Diego Gulls of the IHL, scoring 42 points in 81 games. Over his NHL career, Lindy Ruff scored 105 goals and 195 assists for 300 points in 691 regular season games while amassing 1264 PIMs. He played in the NHL for 13 seasons. Lindy Ruff's coaching days are probably better known. He got his start in 1993-94 as an assistant coach with the Florida Panthers, a position he held until after the 1996-97 season. In 1995, the Florida Panthers advanced to the Stanley Cup Finals versus the Colorado Avalanche, but were swept. This was Lindy Ruff's first taste of the Stanley Cup Finals, but it wouldn't be his last. 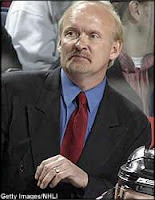 Lindy Ruff was hired in 1997 as the head coach of the Buffalo Sabres. In his first season, the Sabres lost to the Washington Capitals in the Eastern Conference Finals after posting a regular season record of 36-29-17 for 89 points, third in the Northeast division, and sixth in the Eastern Conference. Ruff took the Sabres another step further in the 1998-99 season when the Sabres lost in the Stanley Cup Finals on the controversial Brett Hull goal to the Dallas Stars. The Sabres' best finish in the regular season under Ruff came in the 2005-2006 season where they went 52-24-1 for 110 points, second in the Northeast, and fourth in the conference. The lost in the Eastern Conference Finals to the eventual Stanley Cup Champions, the Carolina Hurricanes. To date, Lindy Ruff has amassed a coaching record with Buffalo of 338 wins, 261 losses, and 101 ties/OT losses/shootout losses. His record this season is a stellar 33-12-4, good for 70 points, first place in the Eastern Conference, and second overall in the league. *NOTE: They were still the Buffalo Sabres at this point, due to the fact that they weren't wearing their current ridiculous logos. Gary Bettman always does this little thing around the NHL All-Star Game called the "State of the Union Address". Basically, it's a big press conference where he manipulates stats to make himself and the league look really good when we all know he's lying about some of the stuff. Other stuff, we have no clue about, but it's better to take that with a grain of salt. In my experience, I find Bettman to be a spin doctor. He never quite tells the whole truth, but markets his version of the truth well enough for people to say "that sounds alright". I'm going to do the same. Here is Teebz's unofficial, non-NHL-endorsed State of the Union Address. "The NHL, as it stands right now, is finding its way back onto the mainstream sports stage. The action in the NHL has never been better, and there are some really good players showcasing what they can do on a nightly basis. Penalties are up, meaning more powerplays, but the players know that in order to succeed in this new NHL, clutching and grabbing and interference will not be tolerated. The officials have done a wonderful job in eliminating as much of the holding and hooking as they can, and we at the NHL Head Offices applaud their efforts. "There is some concern over the shootout, specifically the officiating of the shootout and what constitutes a goal. The Chicago Blackhawks lost a point due to the NHL goal judges in Toronto overruling the on-ice officials after the puck slid slowly into the net. In fact, you can view the video here. Having reviewed this myself, changes will be made. No longer will the goal judges at the NHL Head Offices in Toronto be allowed to change an on-ice official's call if (a) there is no call for a review, or (b) there is a blatent and obvious missed call on a goal by the on-ice officials. The second example is best shown by the Dallas Stars-Edmonton Oilers game in early November. You can view the video here. We support our officials in every way we can, and our Toronto office goal judges are there as support for the officials, not to overrule them as they feel. "While the discussions in Pittsburgh are ongoing, and all media is focussed on what the Penguins are going to do, I am here to tell you that I will assist in any way that I can in order for the Penguins to remain in Pittsburgh. However, from an NHL standpoint, we do have concerns about other franchises. The Florida Panthers are currently playing in an area populated by more retired senior citizens than any other demographic. While we encourage our elders to come to NHL games, the Panthers have moved further away from their market, Miami, and have seen a drop in attendance as such. While I cannot disclose the lease information the Panthers have with their current arena, the NHL will recommend to Mr. Alan Cohen and Mr. Bernie Kosar that they move their franchise to Miami sooner rather than later. While I'm not going to enter into any discussion about poor management of teams in terms of their on-ice performance, relocation of teams and/or expansion of the NHL will be a moot point until further notice. Teams with lower attendances in large markets will have to find a way to market themselves accordingly, whether it be lower ticket prices, better players, or some other factor. "Our on-going relationships with the AHL and ECHL have provided the NHL with some excellent players and results, and we will continue the partnership agreements with both leagues. "The NHL, in its constant search for better technology, will be introducing new NHL jerseys to the public on Monday at a press conference in Dallas. I am aware that the traditional hockey fan is against the idea of these new jerseys due to their 'template' that Reebok has designed. I am going on record here that we will not have the same fiasco that the NBA had with the new ball it tried to introduce. The players, for the most part, have expressed positive feedback. We understand that sometimes change is viewed negatively. It is because of this that we will be reviewing fan feedback at all NHL games in order to properly adjudicate the changes made to the NHL jerseys. As a result, we also will be lowering the prices of the new jerseys in order for people to buy them if they like them. The current price tag of $349.99 for an authentic jersey will be reduced by 50% to $174.99. Is it still expensive? Yes. But $350 would go a long way towards NHL tickets, and it is more important to have fans in the seats than watching from a local sports bar with a new jersey. "Finally, the NHL would like to express to the fans a large 'thank you' from all 30 NHL teams and the NHL Head Offices for their support of their team and the league. Without the fans, we wouldn't have a league, and we are grateful for any and all support we get. Thank you, NHL fans. We owe it to you to give the best show we can every night of the week." So that's how I'd start the "State of the Union" address to the press. Of course, there would be many questions to follow, and I would encourage them. If you have any questions, please leave them in the comment section. I would love to have my own Q&A period on here, and this could be the start of one today. That's it for today. Keep your stick on the ice! Well, here it is. I decided that I needed a place to release my hockey views instead of spewing them all over other blogs and message boards. Hopefully, this will solve the problem. Anyway, let's get down to business. Specifically, NHL business. The NHL has decided that they are going to change their uniforms. Living in the Great White North, I was unable to attend the NHL ceremony for members of the press only last Wednesday. However, the esteemed Paul Lukas, founder of Uni Watch infamy on ESPN.com and the always-informative Uni Watch Blog, was there, and he has promised a 2pm Eastern time article on ESPN regarding the new NHL threads. I direct you there for more info as of January 22nd when the NHL lifts the gag order. "I’m back from the NHL shindig. As you know, I can’t discuss any aspect of it, so don’t ask. But I will say this: I was seated at a round table, just two chairs away from the Commish. I kept imagining what Teebz would have done if he’d been sitting where I was. Wasn’t pretty." All I know is that I am more than anxious to see these new jerseys. If it's any consolation, Reebok has published a picture of Sidney Crosby in the NHL All-Star jerseys (that's him above in case you didn't know). "Sid the kid" is one of the players signed by Reebok to endorse their products. If the new jerseys are anything like that All-Star jersey, I don't think it's going to be bad at all. However, I'm not a fan of the side panels under the arms. While they do match the pants, the problem is that the jerseys turn with the players, thereby moving the side panels off their sightlines. Also, I'm not sure I approve the loss of the alternate jerseys. I am a big fan of the Oilers' alternate, the Canucks' alternate, the Sabres' alternates (from this point on, the Sabres will be called the "Barney Rubble Hairpieces" on this blog), and the Bruins' new/old alternates (love the lace-up throwback). However, if it kills off the Sharks' monotone black look, the Blackhawks' monotone black look, the Flyers' pylon look, the Avalanche's burgandy Rangers-esque jersey, and the Predators' baby puke green look... I'm all for it. Hockey Scores: This blog will also update scores from big games in the NHL. Tonight's big game featured the Toronto Maple Leafs visiting the Pittsburgh Penguins. It was big because the Leafs have 50 points, and are tied for 8th in the Eastern Conference with the NY Rangers, while the Penguins have 48 points, and are two points out of 8th in the East. Jeff O'Neill opened the scoring on a powerplay for the Maple Leafs before the Penguins rattled off seven straight goals en route to a 8-2 victory. Highlights included a pretty goal from Jordan Staal, a Mark Recchi hat trick of three consecutive powerplay goals, five assists off the stick of Evgeni Malkin, and a Jarkko Ruutu penalty shot goal. With the win, the Penguins are tied with both the NY Rangers and the Toronto Maple Leafs for 8th in the Eastern Conference. Pittsburgh has 36 games remaining, New York has 34 games remaining, and Toronto has 33 games remaining. The battle for playoff spots has started early this season. Alrighty, that's all for tonight. More NHL chatter tomorrow. Until then, keep your stick on the ice!